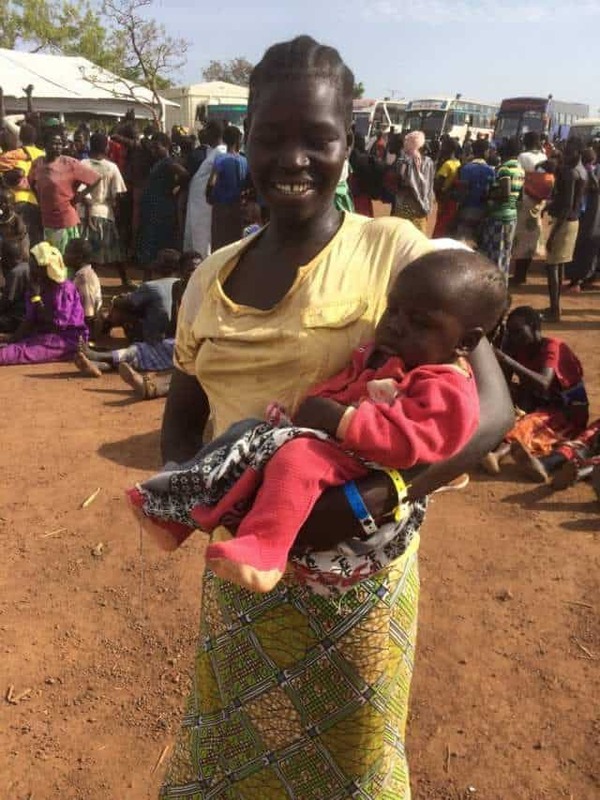 A young mother from South Sudan is thankful to be in a refugee settlement in Uganda, after walking with her baby for days to get there. But she anxiously awaits her husband and their other two children. 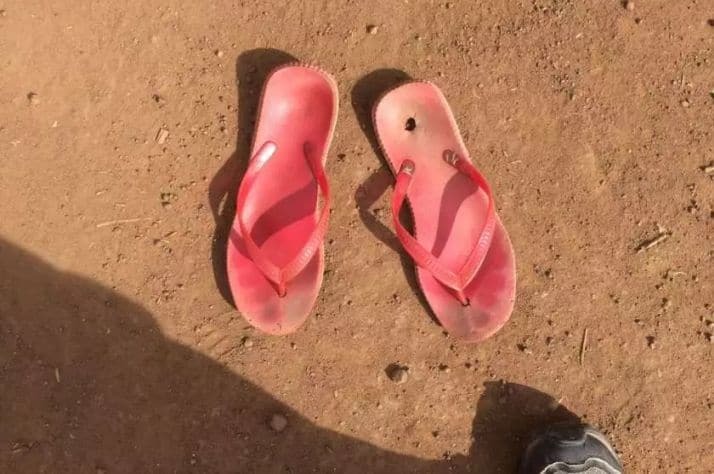 Her ragged red flip-flops, worn through at the heel, give only a small hint of what Margaret Kuyunge has endured in recent months. The 27-year-old is one of more than 1.2 million people from South Sudan who’ve become so desperate to escape the horrors of their East African nation’s civil war that they’ve arrived in Uganda as refugees. Margaret doesn’t know if she’ll see her husband or four-year-old and seven-year-old children again. She lost track of them during their escape. Only her five-month-old son Eric is with her. They walked for four days and nights. She wore only flip-flops as she walked through remote bush, fearing attacks by military forces if she travelled South Sudan’s dirt roads. When Margaret and Eric finally reached Uganda, United Nations High Commissioner for Refugees (UNHCR) employees bused them to the Imvepi Refugee Settlement. 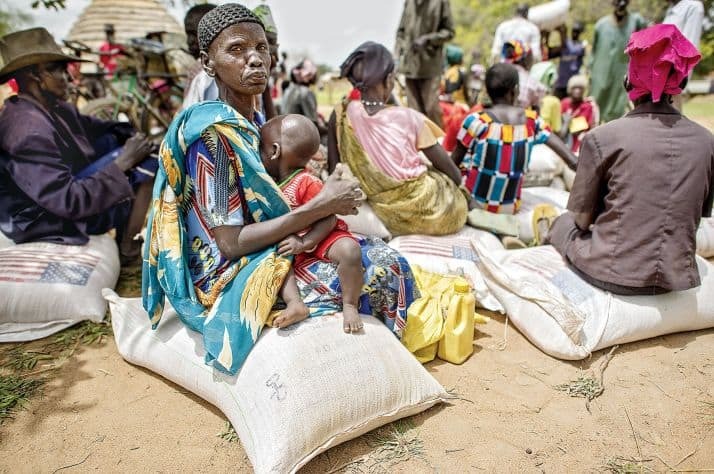 It’s one of several established by the Ugandan government and UNHCR to accommodate the more than 2,000 hungry and thirsty South Sudanese people who arrive in Uganda each day. When Margaret and Eric reached Imvepi, they received a medical checkup, food and water, and temporary shelter. Soon, they will be given a small parcel of land, and a small hut will be built for them. Although most refugee camps prevent occupants from mingling with the local population, Uganda’s settlements have no fences, and new arrivals and local residents are encouraged to interact. It’s a unique model for sheltering refugees, with Samaritan’s Purse Canada playing some key roles. Margaret Kuyunge is a South Sudanese refugee in a camp in Uganda. In the Bidibidi Refugee Settlement (the world’s largest refugee facility, with 272,000 South Sudanese plus thousands of Ugandans) Samaritan’s Purse is using donations from Canadians to drill water wells. Seventy per cent of the water from the wells Samaritan’s Purse is drilling in Bidibidi and Imvepi is earmarked for refugees, while the other 30 per cent is for Ugandans. Enabling Ugandans to have a share of the water is designed to dispel any resentment the Ugandans might feel towards their new neighbours. When Samaritan’s Purse drills a well, it asks beneficiaries to form a committee to oversee it. The committee is comprised of refugees and Ugandans — another way to help them accept each other. Samaritan’s Purse is also building communal and household latrines in Bidibidi and Imvepi, and distributing seeds and farming tools to help reduce people’s dependency on food rations. Again, 70 per cent of the latrines, seeds, and farming tools are for refugees and 30 per cent for Ugandans. Why is Uganda investing so much to integrate the refugees with native Ugandans, rather than treating them outcasts? Because, says native Ugandan and Samaritan’s Purse employee Steven Irumba, many of his nation’s current political leaders were refugees themselves in the 1970s when Idi Amin was president. Amin ordered the deaths of as many as 500,000 Ugandans, and forced others to flee to neighbouring countries. Dennis Mbaguta, the Ugandan government official directing Imvepi Settlement, says Samaritan’s Purse is playing a key role there and in Bidibidi. “We really appreciate what you are doing for the people here,” he told me. Despite her seemingly sorrowful situation, Margaret can still laugh when I ask to photograph her worn-out flip-flop. The courageous young woman says there is still humour because she is thankful that she and Eric are alive, and finally safe from the civil war. “We would like to stay here because we don’t know when the war will end,” she says. East Africa Crisis Relief Samaritan’s Purse is responding to the crisis in East Africa caused by severe famine, drought, and conflict. We provide food, shelter, safe water, medical care, and other aid. Your gift will help us bring critical resources to the those affected in the name of Jesus Christ.